If you’re considering a trip to Hawaii’s Big Island or already have one booked, you’ll want to learn about the island’s latest outbreak of Dengue Fever—and find out how to protect yourself, so you don’t spend your Hawaii vacation feeling ill. Currently, 107 people have been infected with the mosquito-transmitted disease. Ninety-three are Big Island residents, and 14 are residents. Eighty-three cases have been in adults, and 24 cases have been in children. The Hawaii Department of Health (DOH) is still investigating possible areas where cases may have been exposed to infected mosquitoes. Current investigations have identified South Kona (in particular Hookena and Honaunau) as an area of particular concern, but the entire island is considered to be at risk. And, keep this in mind if you’re traveling to any of the other Hawaiian islands during your stay: ALL islands in the state should be vigilant and take measures to reduce mosquito breeding grounds. The Hawaii Department of Health has revamped its "Fight the Bite" campaign to target the Zika virus. Since the symptoms are pretty serious (they begin in seven days and include high fever, headache, nausea, muscle aches, bone and joint pain and a red rash), and there are no existing vaccines to prevent the illness or any specific treatment, it’s important you know what to do in order to reduce your risk of contracting the disease. 2. Wear long-sleeved shirts and pants to limit exposure to mosquitoes. 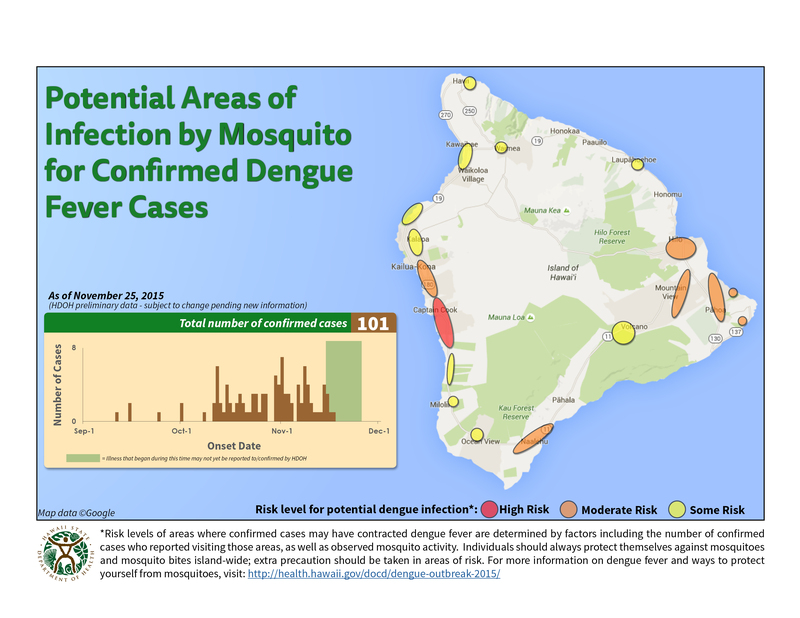 So far, only certain areas of the Big Island have been affected by Dengue Fever, but other areas are at risk, as are the other islands. Oil of lemon eucalyptus [active ingredient: p-menthane 3,8-diol (PMD)], a plant-based repellent, is also registered with EPA. In two recent scientific publications, when oil of lemon eucalyptus was tested against mosquitoes found in the U.S., it provided protection similar to repellents with low concentrations of DEET. Choosing the right activities can also reduce your risk of contracting Dengue Fever in Hawaii. The tour professionals at Hawaii Aloha Travel can help you decide which excursions are in areas without high concentrations of mosquitoes. For example, you can take a Big Island Helicopter Tour, which will take you above the treeline and AWAY from those pesky mosquitoes! 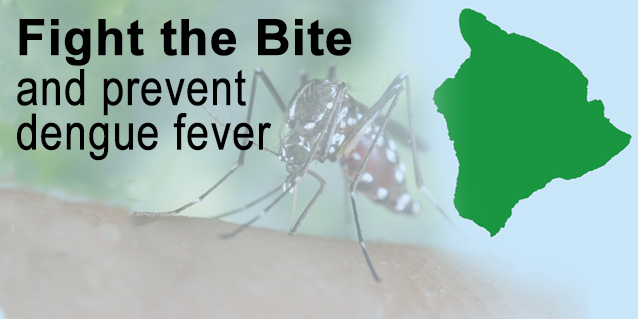 For the latest information about Dengue Fever in Hawaii, go to http://health.hawaii.gov/docd/dengue-outbreak-2015.